Facts about Gothenburg - the City on the Swedish West Coast. Here follows some different facts about Gothenburg. close to 900 000 in the so called Large-Gothenburg (incl some small areas outside the centre). Otherwise approx 500 000. Were is the second largest city in Sweden located? Gothenburg is located on the west coast on both sides of the river Göta Älv - at the bay Kattegatt. Gothenburg was founded year 1621 by King Gustav II Adolf. Below we present public holidays and other enjoyable occasions that are celebrated in Sweden. June June 6: Swedish National Day and the Swedish Flag Day. Landvetter Airport - the airport is located 15 miles east of Gothenburg. To go from the airports to the city centre, you can take the bus or a taxi. Call 112 when you need acute help and when it is danger for life, property or environment. Emergency number 112 is for you that need help immediately by the police, rescueteam or ambulance. 114 14 is the number you shall call when you have got an errand to the Police that isn´t acute. From abroad you can call +46 77 114 14 00. One good thing to do when you arrive in Goteborg, is to get some maps or other material of what is going on in town. Gothenburg´s Tourist office Nordstan, Nordstadstorget, Göteborg. 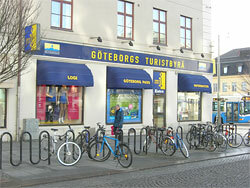 Access to internet for free you will find at the Goteborg City Library at the top end of Avenyn, beside Götaplatsen. Other places with internet in town is for example: the Central Station, but also at some MC´Donalds and 7-eleven stores. Smoking is forbidden in public places like buses, trams, cinemas, stores, restaurants and bars. If you don´t know please ask somebody there you are. Why is Gothenburg called "Little London"? In the 1800´s Gothenburg started to become more industrial and this was a great deal to the many Scottish and English businessmen that had moved to Gothenburg. At this time we had big trade over the North Sea with Great Britain. Many Englishmen and Scotsmen became very wealty as among other: Carnegie, Chalmers, Chapman, Dickson, Hall and Keiller. They donated some of their fortune to Gothenburg and this ended in that the city got it´s Library, University and Hospital. These persons made a good impression on the town and so for that reason, the name "Little London".